Latest post Tue, Mar 10 2015 9:01 PM by gumbycat99. 6 replies. Please fix the SubCap special characters bug that has appeared with version 8.3 of Media Composer (Mac Pro cylinder 12-core, Mac OS X 10.9.5). When I'm trying to type characters that are special for my language (Latvian), such as Ā, Š, Ņ, Ī, Ķ etc, they appear as question marks on the image (see attached picture below). Also, when I close the Master Caption list, and reopen it, those characters have changed to question marks there as well. So, there's no way how I can add subtitles in Latvian in Avid anymore, and this is a disaster for me, since I have to add subtitles all the time. Now I even don't know, what to do - looks like I will have to export cleanfeed picture from Avid, and add subs in some other applicaton, which makes my workflow (that I've been sticking to for many years) so much more heavy, time consuming and complicated. All of this was working smooth in MC v7.0 and earlier, but seems to be broken in the latest release. I tried both importing Avid DS script file (edited and exported from MC v7.0) and writing text by hand in Master Caption List, and it is the same all the time - question marks instead of those special symbols. Please, Avid, fix this, otherwise I'm in a big trouble! And I'm sure that editors in other countries with specific alphabets are also pulling ther hair out because of this. Did you change OS versions when this problem started? I wonder if the problem might be in that area. No, I did not. Before installing v8.3, I wanted to upgrade to Yosemite, but then I read this link: http://avid.force.com/pkb/articles/en_US/compatibility/en267087 (I have a 12-core Late 2013 Mac Pro) and decided to stay with 10.9.5, so from the very beginning my MC v8.3 was running on this OS X version. I'm pretty sure all the subcap issues came about in v7.0.x - and are related to how it deals with unicode or extended character sets. The subcap tool has serious performance issues in 7.0.4. In a 45 minute sequence with 10 audio tracks and 4 video tracks, and a handful of subcap effects, as you type text into the tool, it displays so slowly that it will reverse characters. You type "subcap" and you get "sbuacp" or something like that. I generally have to type each character and then wait a second or two before typing another. Which is ridiculous. I've just tested this on MC8.3, Windows 7, and can report exactly the same behaviour as the OP, Krishius. 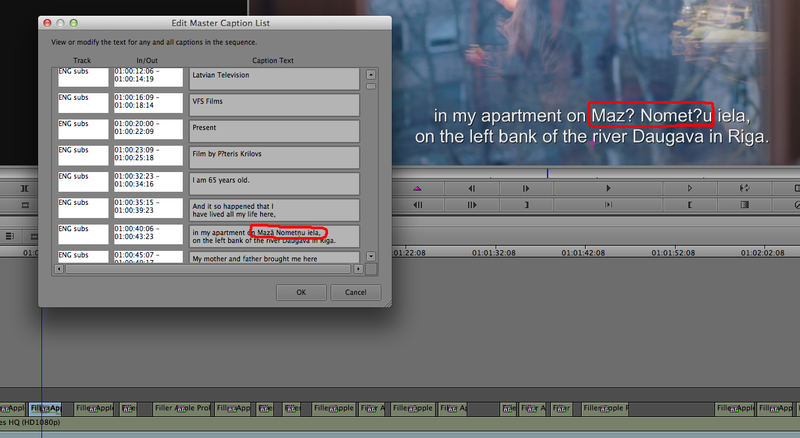 I import the subtitles file (Avid DS format), and the macron characters come out wrong. I open the Master Caption List where I would normally edit macron characters (because you can't edit them in the Effects Editor - why??? this should be updated, we're not in the 90s anymore!) and paste in the character from my text document. It looks fine initially, but when I close the Master Caption List it turns into a "?". Re-opening the Master Caption List, it is still a "?". This is terrible, I've just updated from MC5.5 and do a lot of subtitling that uses macron characters. I'll have to downgrade to something that works until this is fixed. But it sounds Like MC7.0.4 (which is the obvious choice to go back to) is broken too! I'm trying to do subtitles in MC7.0.4.2 on Mac 10.9 and am getting the same result as in MC8.3, macron characters are appearing as a "?" and fixing them in the Master Caption List doesn't help. Is anyone from Avid dealing with this? It's been a crucial part of my workflow for years and now it's broken!